Mersal Live Audio Launch official update has been announced. The grand audio launch of the Ilaya Thalapathy Vijay’s Mersal will be live on Television, Facebook, Twitter, and YouTube channel. Actor Vijay fans can watch the Mersal Audio launch on Sun TV on coming Sunday, August 20. The only TV Channel that will telecast Mersal Audio Launch live. Announcement about Mersal Live Audio Launch on Twitter & YouTube. 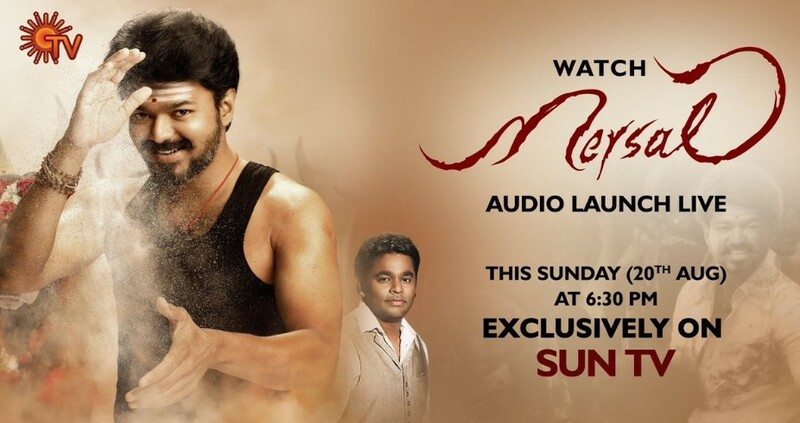 The latest promo is telecasting now on SunTV it reads that the Mersal grand Audio lunch event will telecast live on coming Sunday evening at 06:30 pm. Early it was expected that the Mersal Music launch live on Zee Tamil, because they bought the rights of the film to telecast their channel. The maker has released the official paper advertisement regarding Mersal Audio launch. In that, they didn’t mentioned anything on live event and live telecast. Stay tuned for more latest updates on Mersal live Audio launch and other new updates which revolving around the film.